This 5 bedroom period property, located in Ryton-on-Dunsmore, had been renovated to a high standard and was on the market for £550,000. It had been on the market with one agent for several months with no significant interest. Although it had been freshly decorated and modernised with new fittings and fixtures as well as made to measure quality curtains it had no furniture in it to demonstrate how each room could be used. It was located on a busy road which we believe was probably a turn off for a number of potential buyers. The newly appointed agent, who we work with regularly and understands the power of home staging, called us in immediately to make the most of the internal space and wow his viewers. Working with the chosen colour scheme and decor we were able to introduce pieces of furniture that complemented the look of the property, whilst being functional and stylish at the same time. A large amount of the original character in the property had been retained including exposed beams and stained glass windows which meant that we could create the perfect mix of old and new. There were 5 good sized bedrooms, 3 on the first floor and a further 2 on the second floor. We used a sofa bed, TV and beanbags to create a snug area which helped buyers to see how the top floor could be used as a playroom or teenage den space appealing to a larger market. In the kitchen/diner we created a multifunctional space which created a hub of the house for eating or relaxing. 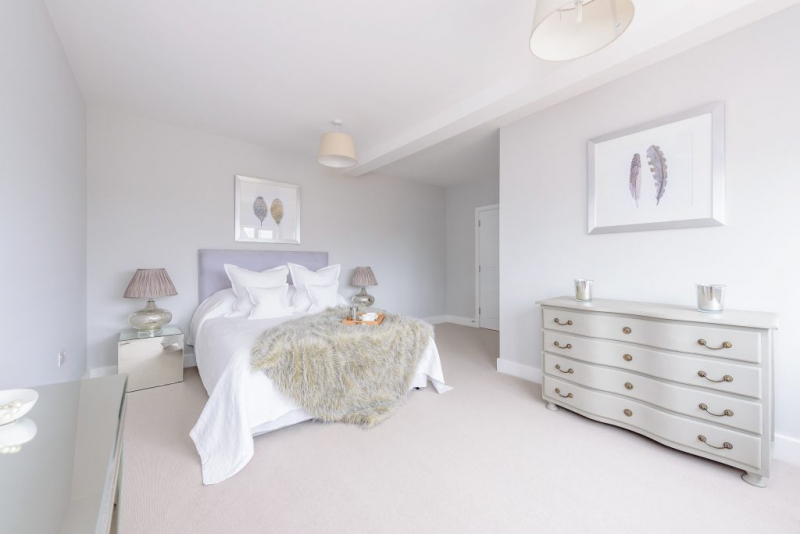 Fully furnishing the property gave a clear function to each room and helped prospective buyers to visualise how they might live in the house, especially the open plan living area and second floor snug. The newly appointed agent suggested it should return to the market at offers over £500,000 once it had been furnished. The cost to the vendor was just 1% of the guide price and resulted in multiple offers at the Open Day. The house sold for £30,000 more than the guide price and the developer client and the estate agent were extremely happy with the result! The developer has since asked us to dress a show home on another of his sites.